Mandala stencils are very popular in today's decorating. 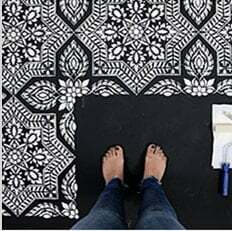 With our Compassion mandala stencil, you can quickly add beauty and pattern to any plain wall or floor. Let's call for more Compassion in our lives :) Our large mandala stencils can be stenciled in one or multiple colors to match your decor. Mandala stencils are quite easy and fast to use despite there intricacy. Mandalas are a perfect choice for a first time stenciler. Our mandalas are original hand drawn designs created by stencil designer Janna Makaeva, and exclusive to Cutting Edge Stencils. For the mandalas that are 18" to 30", you will be receiving a full circle stencil. For the 36" and 44" mandalas, you will receive half of the design. To complete the circle, tape and stencil the 1st half of the mandala, then pick up the stencil, rotate it 180 degrees and line up the registration marks (see photo above), tape it and stencil it again. For the 60"+ mandalas, you will receive a quarter of the design. To complete the design using a quarter stencil, tape and stencil the 1st quarter. After completing one quarter, rotate the mandala over to stencil the half using the registration marks. Rotate and stencil the mandala quarter 2 more times until you've completed the whole circular design.